Yesterday I was going through my books preparing for the coming Book Arts RUSH and found again my current published books on pigment history. They are both books about early art material production. These books interest me because Medieval artists or their staff made their own paints. Knowing that paint production history enhances your color use when recreating illumination art. These two books present you tantalizing background stories and trivia about the complete color creation processes. In this book, you read varied, interesting stories describing Finlay's quest for the world's historical pigments and dyes. Written as a travelogue through color history, her book takes you from Afghanistan to the Australian outback, to China's ancient caves, and Spain's saffron harvest. You read vivid stories, anecdotes, and adventures about the colors themselves. About Cleopatra's saffron use for seduction. Historically expensive ultramarine blue production from lapis lazuli extracted from an Afghan mine. And how carmine red, still used today in lipstick, is made from the blood of insects. I liked Finlay's book for its intriguing historical information, especially the extensive notes in the back. Unfortunately, I lost interest and only skimmed through her detailed personal travel descriptions. Instead, I jumped to the color fact chapters labeled by their names. 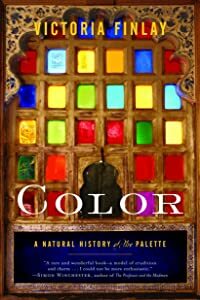 This book tells you about western art history through the physical substances used to create color. How art, chemistry, and technology interacted creating the gorgeous colors you see on our walls, in art galleries and illuminated manuscripts' pages. The author is a physicist and chemist who understands sciences' part in color perception and pigment manufacture. But he's also able to describe its facts in vivid and enjoyable detail useful for an artist. 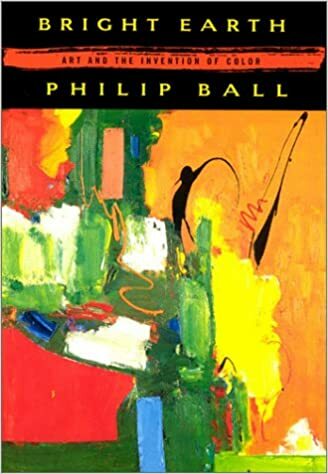 Ball's book goes back to the Egyptians, but most of it is about the classic artists' use of mediums and colors. He gives you intriguing insights into their fresco, tempera, and oil painting techniques. You read about the minerals, plants, and insects artists used to produce various colors. How early in history the color you needed perhaps didn't even exist or was so expensive it was restricted to Saints' paintings the most important thing artists then portrayed. And how their palette options changed from the middle ages to the present when manufactured hues revolutionized their choices. If you have a passionate interest in color history, pigment discovery and its detailed development Ball's book is the one to read. 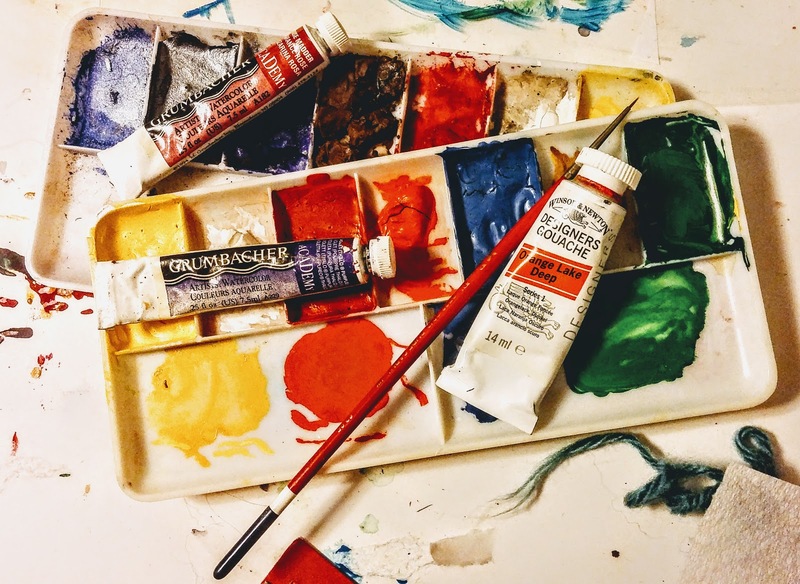 As an SCA scribe and illuminator, I think knowing pigment sources, how paints are produced and the histories behind them add dimension to your creations. Both books tell well the miracle you have in your paint palette and tubes. As I mentioned before my new passion is developing my persona. While I will never be a Duke Cariadoc of the Bow I'm doing more things Jehanne would have done. I, as Jehanne, lived in 15th century Burgundy in Ghent and Bruges. A prosperous time, well-developed in trade crafts. It eventually came under Maximillian I and Mary of Burgundy's control. The Holy Roman Empire. I'm not into learning any housekeeping tasks, current or medieval, but I asked myself: "Living then and there, what individual crafts would you do?" "How would you make a special gift?" 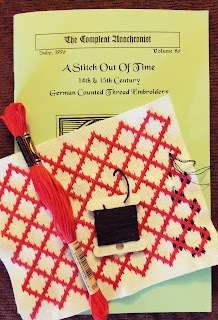 Since Jehanne lived part of her life under Max's Holy Roman Empire, currently Germany, I decided to try it's counted thread embroidery. I found Cynehild Cynesigesdohtor's "German Brick Stitch" pdf directions online. And used them as a starting place. Digging around in my stash I found the red DMC floss color 666 some even-weave linen. Intending to make a needlebook I began embroidering. I soon learned I couldn't see the holes near the linen thread's thinnest parts. My experiments became choosing the fabric and thread I would use. After the even-linen, I tried double woven Aida cloth, also from my stash. This didn't work because these directions put a thread between the Aida cloth's paired fibers. I looked through my clothing fabric stash, but they were the wrong color or had huge fiber counts per inch. That meant I was forced to buy even-weave embroidery fabric. Which I bought in white at my nearby Joann's. That worked the best, even though you see fibers so near each another they seem glued together. Working independently from the handout, I first embroidered an overall "grid" pattern in DMC red 666. This is when I fell in love with repetitive embroidery. When I finished the red "grid", to separate out the pattern's dramatic lines I did the pattern's smaller yellow sections. But I'm doing them in black, a Lonely Tower color. Since I used 3 strands of DMC red 666 I switched to 3 black strands. Amazingly, 3 strands of black thread do not fill the cloth as well as the red 666. To look as dense as the red I had to use 4 strands. I didn't expect that. Also on this adventure, while waiting for scribes to visit, I looked through my old embroidery books. Wallah, I turned up M. Richard of Waymarc's Compleat Anachronist, 1995. I forgot I even had this. It's been on my shelf ever since it was published. I should have started with it. It's a great how-to for this. I'll continue embroidering not only because it's a persona-possible activity, but because I like it. I like the repetition and once I get started it becomes its own pattern. Even the following steps are easier to make. I also like the small size project because it's portable and completed faster. And I like a craft I can work without thinking and watch a video, tv program or while visiting with friends. I think this one's a keeper. If you haven't already I hope you'll give it a try too. When you look through this 16th-century songbook made for a Bruges aristocrat you see it's filled with artistic, decorative daily life images. But it also includes many that are bluntly bizarre or crazy. It's the Cambrai Chansonnier, MS 0128 dated 1543. Its fun pictures are delicately drawn in pen and ink then enhanced with color washes. I love the clever images you see worked through a music staff. And those useing the staff lines as a panorama picture frame. While it's decorative versals may be creative floral combinations, many you see are just weird, like this anthropomorphic versal. I get the scribe created the unique posture to make a capital "A". But why dream up the weird behavior? And this is one of the kinder weird images. Some are too inappropriate for even my blog. If you're curious have a look. There are so many images to recreate you can be selective. Consider the intended recipient's values and your pictures purpose. Above all have fun, because the original artist did. Or the perplexing images wouldn't have been created. You can see others in my series Perplexing Pictures In Manuscripts: 1, 2, 3. Does your metal broad-edge pen nib give your calligraphy hairline strokes? Or does it have a burr that hangs up on the paper? Don't throw it away. Sharpen it. Nibs aren't sharp like knives. But sharper nibs give narrower strokes. You want a slope or bevel on your nib edge to reduce the amount of metal that touches the paper. But if it's too narrow it dulls easily or burrs. To sharpen my nibs I use the flat side of a hard small white Arkansas stone. I also don't use it with oil. You want to create a bevel that is about 45° for larger nibs, less the for the smaller nibs we use in the SCA. The smaller angel for narrow nibs is to retain the edge's strength. Strength is more important than extreme thinness. I've also done this to my cartridge pen nibs. Even my Rotring. Works wonders for me. In my opinion, this video "Calligraphy - sharpening nibs" by Patricia Lovett, published on YouTube Aug 19, 2013, is the best current video showing nib sharpening. This will help your calligraphy; it did mine. Tip: If you're having trouble getting your nib to start writing, give the nib's back a few strokes to restore its lost crisp edge. It's easy. You'll be able to make hairline strokes that are cat's-whisker-thin. At Lonely Tower's scribes gathering recently Ly. Kristin asked what the basic illumination skills were that she should learn. Kristin is an accomplished preprint painter with wonderful skills, but she wants to take it a step further. How does she know what skills she should learn? Where would you look? A great starting place is this archived article "A Guide For The Beginning Scribe". I found it on the humongous Atlantian Arts & Sciences Links webpage. Then go to Scribal Arts and finally Beginners' Guides to Scribal Arts. Since it was written in 1998 it doesn't give the author. That seems weird today, but I still have an early class handout from M. Agnes de Lanvallei that does not show who taught the class. I know because I took it. That's what happened then. If you are wondering what calligraphy or illumination skills to pursue this article gives you their concise descriptions. It's like a scout badge requirement's list giving you their step-by-step descriptions and their purpose. It even gives you tips. While the article is not any Kingdom's detailed handbook or a Patricia Lovette practical guide, it is a well-begun overview. And it's said, well-begun is half done. After creating original medieval art for a few years, if you're searching for skills to teach this article lists ideas from which you can choose. Become proficient in them then write in-depth handouts for your students. Be able to knowledgeably and easily talk about how you do each step. Experiment and develop your own tips as this guide gives. And consider the most interesting way to present your topic. Developing students and teachers can both benefit from the descriptions in this anonymous C and I "Basic Guide". That is a lot from one old archived article. Testing - Which Gouache Brand Rewets Best? I often read James Gurney's blog the Gurney Journey. Gurney is the Dinotopia guy. His art is amazing and his posts inspiring. Recently, I found a post of his I think you'll find interesting. Some gouache tests his associate Cathy Gura ran comparing gouache brands rewetting behaviors. 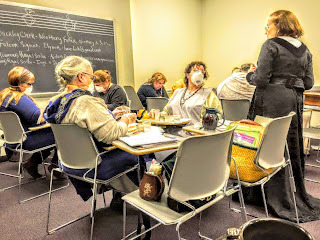 She also compared their consistency and of all things their smell. I was intrigued because Cathy did these with gouache straight out of the tube. As an illustrator, Cathy likes working with gouache directly from the tube which is how we work. Considering gouache's cost she likes the results Winsor and Newton's gouache provides. And how it dries shinier than others without adding glycerine or gum Arabic. Who would have known or even wondered if some gouache brands are better at reconstitution than others? Leave it to a professional. How about an inspiration boost? Websites you might browse to charge your creative history juices. An Internet Round-up. Here are five blogs from different eras each painting their own authenticity recreation picture. Your introduction to their personal history journey. I enjoy losing myself in photos and stories other history buffs have. I search their projects and event descriptions imagining how they created their works whether clothing, hunting, manuscripts, embroidery or more. I know you'll find these inspiring. Anachronistic and Impulsive Ancient Rome and Byzantium in the Current Middle Ages. Exploring the medieval hunt describes renacting everything involving the medieval hunt around late 14th century. Miriam's Middle Eastern Research Blog to help spread knowledge on the lands of the Islamic Middle East (known as the Dar al'Islam) from the fall of the Roman Empire to 1600 C.E. St. Thomas Guild is a medieval reenactment group centered in Nimweghen, the duchy of Gelre around 1370 (currently the Netherlands). Medieval woodworking is its focus but sewing, embroidery, and jewelry are sometimes included. Please let me know what you think. You can do that in the comments thing below, if you like. I enjoy when you reply. 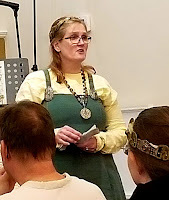 Bloggers of Calontir present you - their readers - research, information and personal thoughts about reenactment and history. I am interested in personal bloggers who post SCA relevant information at least quarterly. And I have another blog for my list. This one belongs to a Calontir friend. It is a new blog. Although she's not new to blogging, she has another. That one is modern with widely diverse topics. This one will focus on the SCA. 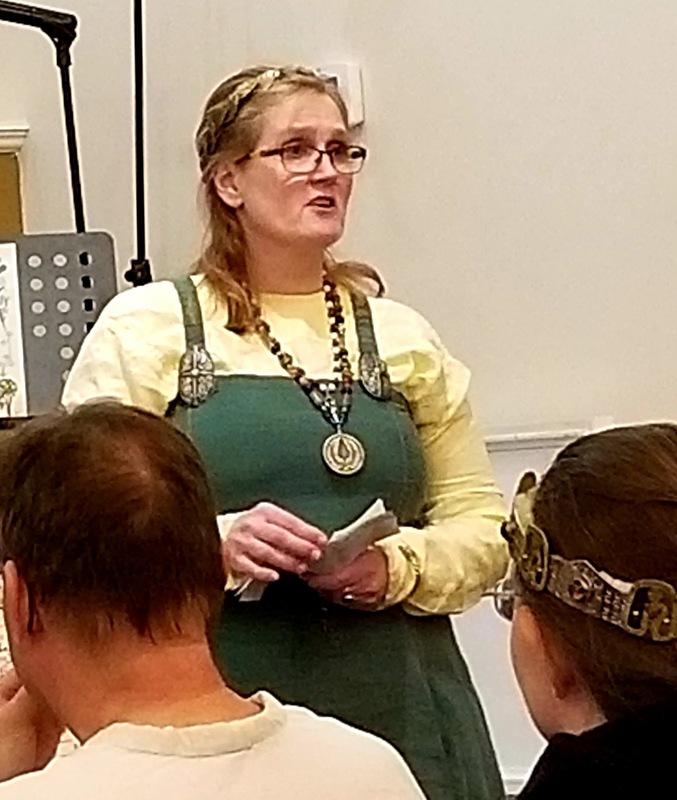 Her new blog is "Auntie Aidan's Lazy Laurel -Musings, Posts, and Paricles on Life in the SCA". Or I suppose you can just call it the Lazy Laurel's blog. She would. But M. Aidan Cocrinn is anything but lazy. She's a laureled production scribe, an accomplished writer, and is Calontir's Minister of Arts and Sciences. Her third kingdom job. All this and employed outside the home, too. Your blog is your story, your musings. It's like writing a lengthy letter home while you are visiting another country. You're excited and want to share what you've seen, learned or did. I'm confident M. Aidan's musings will show you that and tell you even more. Find her blog and welcome her to the Calotir blog sphere. You''d be getting in on the ground floor, as it were. You may have noticed I've stepped up my local SCA participation. It's difficult for me to get away from the Barony so I've decided to do more here, taking on more event and local jobs. 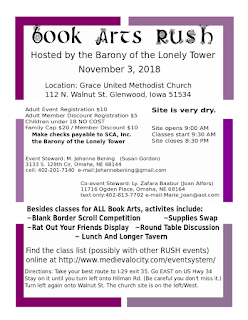 I coordinated crash space at Bardic Bedlam, Arts & Sciences competitions at Coronation, and now I'm the Barony's Social Media Officer. 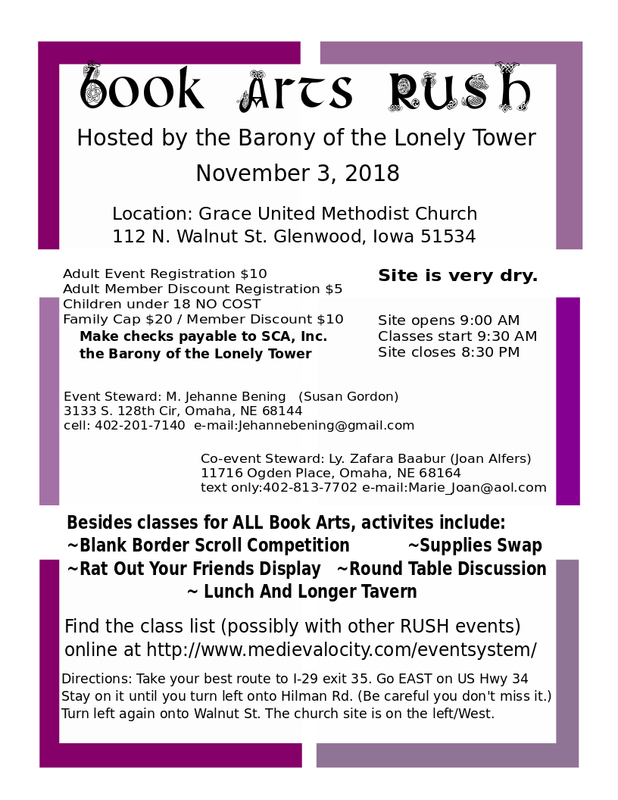 But my bigger project now is organizing a future RUSH Book Arts Seminar. Something Ly. Zafara and I dreamed up. This idea sprang from the Calontir Kingdom's Arts and Sciences Minister, M. Aidan's plan to put bookbinders, text composers and manuscript supplies' producers under the "scribal" umbrella. So. why not have a day of classes including all those skills? That's my main thing now. Making that happen. First I found a site. Wonderfully it's economical. It's the Grace United Methodist Church whose minister is also a Lonely Tower member. And she's also going to cook a long-time tavern for it. That's a plus. Next, I filled out and submitted a bid to the Lonely Tower Financial Committee. It passed easily. Then I designed an event flyer for Calotir's e-newsletter, the MEWS. I downloaded Inkscape from the Microsoft store. Inkscape a user-friendly free publishing program. Especially if you also find a tutorial with a guide that works for your project. Ly. Zafara Baabur, whose the Falcon Signet, is handling promotion at the events she attends, including personal future teacher arm-twisting. She'll also be visiting local supply stores asking for helpful nifty donations. My next step is scheduling six hours of teachers for four classrooms. This project is keeping me busy while helping others throughout Calontir. I'm tickled the early feedback is encouraging. I hope to see you can come.